The University of the Fraser Valley men’s basketball team launched its playoff run with a double-digit comeback victory over the UNBC Timberwolves on Thursday at the Envision Financial Athletic Centre. In a do-or-die, single-elimination first-round game, the No. 6-seeded Cascades had a jittery start and found themselves trailing the No. 11 Timberwolves by as many as 16 points in the second quarter. But after halftime, the Cascades settled down, locked in on defence, and managed an epic comeback, ultimately prevailing 67-59. Their opponent for the best-of-three Canada West quarter-finals is yet to be determined – it will be either the No. 3 UBC Thunderbirds or the No. 4 Saskatchewan Huskies, pending the outcome of Friday’s first-round game between the No. 5 Regina Cougars and the No. 12 Mount Royal Cougars. “We are prone to offensive struggles, but I think there were some nerves with the group to begin with,” Cascades head coach Adam Friesen said afterward. As for the T-Wolves, the result marks the end of an era, as senior standouts Jovan Leamy, James Agyeman, Vaggelis Loukas and Austin Chandler have finished their eligibility. Back in November, the Cascades had swept a pair of regular-season games vs. the T-Wolves in Abbotsford, but on Thursday, the visitors looked the part of a seasoned playoff team and raced out to an 8-0 lead, with Leamy scoring four quick points. UFV was ice-cold from the field, hitting just 21.1 per cent (4-for-19) of their attempts in the first quarter. The T-Wolves continued to roll in the second, reeling off a 13-2 run highlighted by a pair of triples from Tyrell Laing. They led 30-14 at that point, and were up 38-26 at the half. The Cascades, though, were a different team when they emerged from the locker room. They would limit UNBC to just 21 points the rest of the way, leveraging their superior height and wingspan to challenge shots all over the court, and snare contested rebounds. At the offensive end, 6’10” centre Sukhman Sandhu sparked the Cascades. A true “stretch five”, the third-year player from Surrey, B.C. went 4-for-5 from downtown in the second half, scoring 12 of his team-high 18 points. UFV opened the third on an 18-5 surge, capped by an and-one layup from Vick Toor, to seize their first lead of the night (44-43) with 1:28 left in the third quarter. 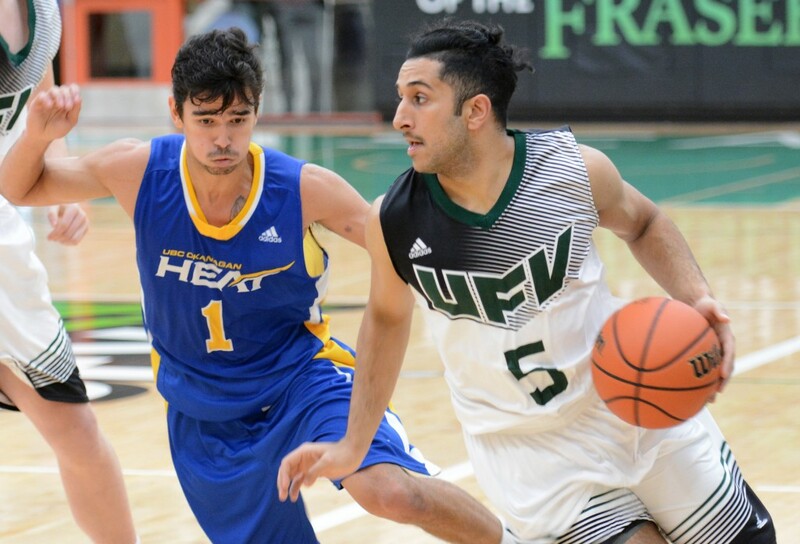 Midway through the fourth, a 6-0 UFV surge, highlighted by another Sandhu triple, gave the hosts a 60-53 lead. In the final two minutes, a gritty Sukhjot Bains bucket in the paint was followed by yet another Sandhu trey to give the hosts a 65-55 advantage and effectively ice the game. Afterward, Friesen revealed that a fiery halftime speech from fifth-year senior Nav Bains served to ignite the comeback. Parm Bains chipped in with 16 points for the Cascades, Andrew Morris scored 10, and the Bains brothers combined for 14 – Sukhjot with eight, Nav with six. Leamy paced the T-Wolves with 15 points, Laing finished with 13, and Vova Pluzhnikov scored 12. The University of the Fraser Valley women’s volleyball team fell in a three-set contest to the Douglas Royals on Thursday evening at the Envision Financial Athletic Centre. The CCAA No. 3-ranked Royals earned set wins of 25-19, 25-20, and 25-16 to improve to 15-6, while the No. 10-ranked Cascades fell to 12-9. “I thought we game planned well, and knew what we were going to do, we just didn’t take care of our side,” explained UFV head coach Mike Gilray. The first two sets were tight early, but the visitors would benefit from timely runs in the middle portions on their way to 25-19 and 25-20 wins. UFV built a 7-3 lead in the third, but Douglas College came storming back with a 6-1 run to grab a 9-8 lead before pulling away to take it 25-16. The middles led the Cascades offensively – Hanna Hieltjes had five kills, while Alysha Cooper had four. Rookie outside hitters Kate Widman and Kristen McBride chipped in with three kills apiece, and libero Cassidy King registered 14 digs. The Royals excelled from the service line, as Avneet Shokar racked up five of her team’s 12 aces. Vania Oliveira had a team-high nine kills, while Emma Schill had six. The Cascades volleyball teams finish the weekend series with the Royals on Friday night in New Westminster (women 6 p.m., men 8 p.m., pacwestbc.tv). The University of the Fraser Valley men’s volleyball team dropped a three-set decision to the Douglas Royals in the first night of a home-and-home series on Thursday night at the Envision Financial Athletic Centre. The CCAA No. 4-ranked Royals posted set wins of 25-15, 25-19 and 25-19, boosting their PACWEST-leading record to 18-3, while dropping UFV to 1-20 on the season. “We just didn’t have it – we looked a little out of sync tonight,” UFV head coach Kyle Donen analyzed. “We didn’t have the same kind of fire I think we’ve had all semester. The Royals raced out to a 15-7 lead in the first set and did not look back, taking it 25-15. The script was similar in the second as they built a 10-6 lead on their way to a 25-19 win. The Cascades fought back in the third, trimming the Royals’ lead from 20-15 to 20-18 on service from Landon Uy, but that would be as close as they would come as the visitors closed it out 25-19. Graeme Hughes had a team-high three kills for UFV, while Shubdeep Wander and Andy Barrero both had two. Reid Marriott led Douglas with 13 kills, and Max Haronga had eight. The Cascades volleyball teams finish the weekend series with the Royals on Friday night in New Westminster (women 6 p.m., men 8 p.m.). Be the first to comment on "UFV Sports Thursday – Men’s Hoops Comeback Playoff Win, Volleyball"